It's not all about the Apple Pencil. Here's our pick of the best iPad styluses for drawing and note-taking – whatever iPad you own. If you want to use one of the many fantastic iPads available now as a tool for drawing, you're going to need a stylus. Your impulse may well be to simply pick up the Apple Pencil, and while this is a great buy and you won't go wrong with it, we'd recommend taking a moment to consider some of the alternative options out there. There are many iPad-compatible styluses available from other manufacturers, and many of them are extra-attractive by virtue of the fact that they cost considerably less than Apple's version. We've picked out the best of the best styluses available right now, for all iPad users and all budgets, so you can find which one is right for you and get to drawing. In the following guide, we'll walk you through the best iPad styluses with integrated buttons that you can customise for different functions, and we'll help you decide whether an iPad stylus with a hard nib or soft nib is likely to be better for your requirements. Need to get iPad to go with your shiny new stylus? We've got all the best iPad deals too. Read on to find out exactly what stylus for your iPad you should buy – and where to buy it for the best price. The new Apple Pencil (2018) works with the third-generation 12.9-inch iPad Pro or the 11-inch iPad Pro. 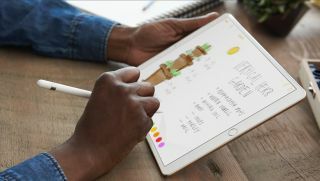 The original Apple Pencil works with iPad Pro 12.9-inch (second and first generation), iPad Pro 10.5-inch, iPad Pro 9.7-inch and iPad (6th generation). The Apple Pencil is, of course, the natural choice of stylus for iPad – but only if you own one of the two iPad models that are compatible with it: an iPad Pro or sixth-generation iPad (2018). If you do, there isn't a better stylus to write and draw with on the market. Not only is it exceptionally comfortable to use, Apple has eliminated many of the issues that can dog other styluses – such as inadequate palm rejection and clear lag that instantly makes you feel disconnected to what you're producing on the screen. The astonishing pressure levels mean that the Apple Pencil reproduces your movements perfectly, at even the most acute angles, and it enhances all your favourite creative iOS apps. The bottom line is that if you've forked out the cash for an iPad Pro, you'd be daft not to swallow the extra expense and go straight for an Apple Pencil. Wacom boasts an industry-leading reputation thanks to its fabulous range of dedicated drawing tablets. So it's only natural that the company produces an attractive line of styluses as well. As well as being our favourite iPad stylus for artists, the Wacom Bamboo Sketch also takes the plaudits for general use on the iPad Air and iPad Mini series thanks to its compatibility with iOS devices. Rather than trying to exactly mimic a traditional rounded pen, the Bamboo Sketch favours an ergonomic triangular design for better grip. It's an excellent all-rounder, but its fine tip and pressure-sensitive nibs make it just about as close an experience to sketching on paper as you can get. With an epic battery life (recharged via USB) it uses Bluetooth to connect to your iPad, which brings the integrated shortcut buttons into play, too, enabling you to set up handy shortcuts within your chosen iOS apps. Despite the fact that you can snag one for less than £30, the Hahakee iPad stylus does a good job of feeling like a premium product, thanks to an aluminium alloy build with a polished finish. It's pleasant to hold and use, and thanks to the healthy forty-hour battery life, you'll find yourself easily getting lost in your projects before it needs a charge. Charging is accomplished via the micro-USB port concealed in the top. With a fine tip, the Hahakee stylus is pleasingly precise, and spare nibs in the box ensure it'll keep on being usable for a long time (indeed, probably considerably longer than the iPad you're drawing on). It's no Apple Pencil, but for the money, it's a great buy. Adonit has been refining its stylii for more than eight years now, and the Pixel is still one of its best for drawing on iPad. Bluetooth enabled and compatible with many of the sorts of apps creatives will likely be using on their tablets, the Pixel boasts 2048 levels of pressure sensitivity and a range of function buttons on its body that can be assigned to the user's preferred tools (though be warned these can be easy to knock accidentally if you're not paying attention). The battery should last for about 15 hours of use, allowing you to get really stuck into your projects, and the sleek design makes the Pixel stylus genuinely enjoyable to use. If you're not sold on the idea of spending upwards of $20/£20 on a simple pointing device, and don't need the specialised functioning of the iPad styluses above, then Adonit's budget option – the Adonit Mark – is worth considering. Despite its cheap price tag, this stylus has been designed to feel as comfortable as possible in your hand, with its triangular anti-roll design. It retains the precision you'd expect from the sole-purpose stylus manufacturer, largely thanks to its smudge-free mesh tip. The Adonit Mark won't win any innovation awards, but if you just want a stylus for navigating around your iPad, you won't find a better cheaper iPad stylus than this.